The reason I was so reluctant to use a content management system is that I’m a bit of a control freak when it comes to my projects. If I design something, it may not be perfect, but at least I know how it works. And if it quits working, I know how to fix it. Content management systems have so many moving parts, so many internal scripts that all have to work together, if you have a bug, good luck ever finding what the problem is. Furthermore, you are at the mercy of the “community” to release an update or offer support. I had seen way too many posts of people trying to fix one problem or another that they were having that it pretty much scared me away. I finally warmed to the idea after dealing with the inconvenience of doing it “my way” for so many years. Throwing up a quick post on a website was actually a major hassle. Plus, CMS has come a long way in recent years. They’ve really improved the systems now and they’ve become pretty security hardened as well. WordPress is a relatively new platform for me. I’ve been familiar with its existence for several years, but I’ve shunned it because I don’t like limitations. I did try it once before, but abandoned it in favor of the more flexible Joomla platform. So far, that one is my favorite for website development. 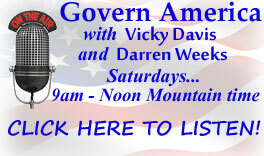 It is what I used for the Govern America website. I have often joked that I can spot a WordPress site in a second because they nearly all look alike. Typically, I am not wrong, but the ease of use is very appealing. They brag about their “famous five minute install”, but to be honest, I actually found the setup process more cumbersome with WordPress than it was with Joomla. WordPress does have a better type editor and is definitely more user-friendly for beginners. The only other one that I’ve tried is Drupal. Originally, it was extremely difficult to use with a huge learning curve. I don’t know if they’ve simplified it, or if it seems easier after I’ve used Joomla, but years later after trying it initially and forsaking it because it was too complicated, I set up a site with it when I was having some hosting troubles and found it to be much more straightforward than it had initially been. In fact, if I wasn’t so happy with Joomla, I think Drupal would be my CMS of choice for large websites like Govern America. For the website you’re reading, I just wanted something really simple with a good editing tool. WordPress was more than adequate for that. It really is a great blogging program and I am astounded at how rapidly and widely it has grown into one of the most-used platforms on the Internet. I like tinkering under the hood with programming, development, and generally being creative. Unfortunately, I just don’t have the time to play like I used to have. Govern America eats up a ton of my time. Sometimes I question whether its worth it.